With the economy on steroids this year there is tremendous construction activity all over the United States. Washington, DC is no exception and we're seeing constant renewal where outdated buildings are giving way to new construction. This means demolition and foundation work in close proximity to existing structures. Care must be taken and disturbance minimized when working within inches (literally) of existing buildings which are occupied, functioning workplaces or residences. Rockwheel excavator mounted rock cutting attachments (sometimes called drumcutters or cutterheads) are an ideal tool when both accuracy and productivity must be achieved simultaneously. 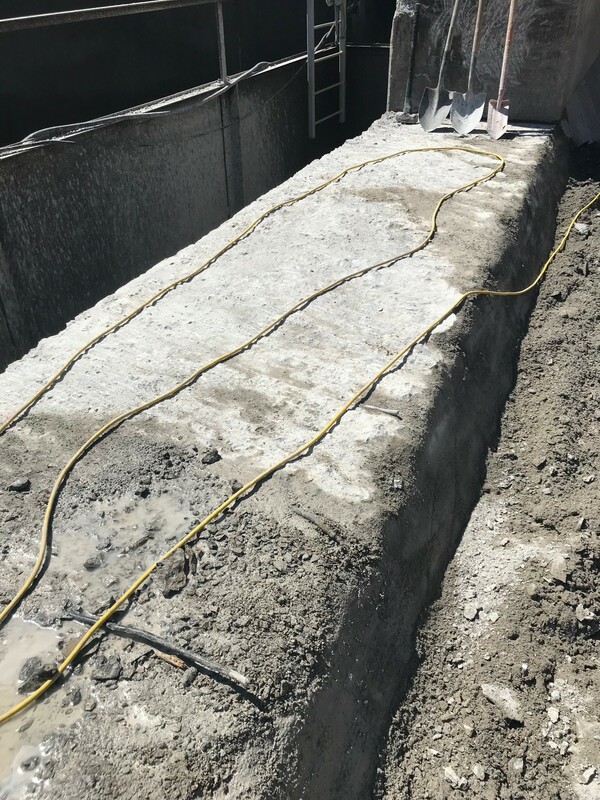 In this case, a limestone bedrock foundation needed to be deepened immediately adjacent to an adjoining building footer. To avoid the risk of damage to the neighboring structure hydraulic hammers were not an option because of shock waves and vibrations that would be reverberate through the rock mass and concrete. This can result in cracks and unseen microfractures that weaken the foundation. Rock grinding attachments attack the rock in a very different manner than hydraulic hammers. Unlike hammers (i.e. breakers), which go after the unconfined compressive strength (UCS) of the rock, the shearing action of the rotating conical carbide picks (teeth) exploits the tensile strength of the rock which is 10%-15% of the UCS. By "raking" the rock at 45-50 deg. attack angle an added benefit is creation of smaller rock fragments and these cuttings can often be used onsite as backfill without crushing. 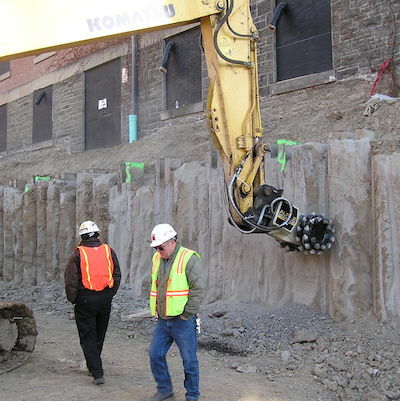 This mechanical rock cutting or grinding results in significantly lower seismic disturbance which means safer rock excavation when close to buildings or other sensitive infrastructure such as gas lines. Moreover, the degree of precision of rock or concrete cutting is exceptional. Rapid and Precise are two words frequently used to describe the cutting action of the Rockwheel drum cutters. Compared to other rock grinding attachments on the market the Rockwheel rock and concrete grinders have a optimal layout of teeth on the drums which results in a smooth cutting action. This means less frequent stalling of the cutterhead, more continuous rock cutting and ultimately more CY/hr (m3/hr). 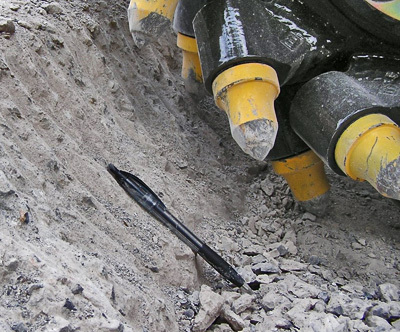 For exceptionally hard material when pick penetration is hampered a demolition drum can be used which features a helical depth limiter which prevents the tool from try to take too big of a "bite". This less aggressive drum decreases vibrations and stalling of the cutterhead which means the Rockwheel is cutting rock a greater percentage of the time. 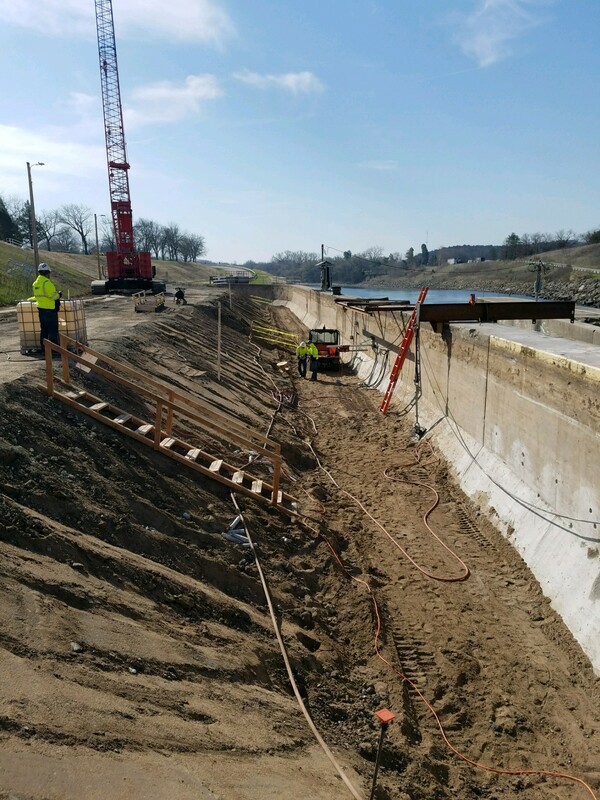 The Challenge: Along a vital waterway managed by the USACE (United States Army Corps of Engineers) a customer needed to remove several sections of 4-ft thick x 8-ft high concrete walls. Concrete was unreinforced with a compressive strength of 4000-psi ( 27.5 MPa). Vibrations needed to be kept to a minimum to ensure no disturbance to adjacent structures. Access was limited to an earthen bench about 25-ft away on the opposite side of a cut. Hydraulic hammers would cause too much disturbance via vibrations and shock waves and were not permitted plus they did not have the capability to provided the desired profiled finished surface. How best to remove these ? The Solution: In consultation with Rockwheel Americas a model D20 Rockwheel (95hp) rock and concrete drum cutter was selected to be installed on a CAT320EL excavator. The Rockwheel was in-stock and ready to go thanks to Rockwheel Americas extensive inventory and national rental fleet. We advised the excavator technician on setting hydraulic flow and pressure for optimal performance. It is always worth the time on the front-end to get the auxilliary hydraulics dialed in so drum speed (rpm) and torque suit the task while making sure multi-functionality on the excavator is not compromised. The Rockwheel installation was "plug and play" thanks to clean hose routing that matches that of the excavator hydraulic lines. No case drain line required and no long hoses crossing the stick. 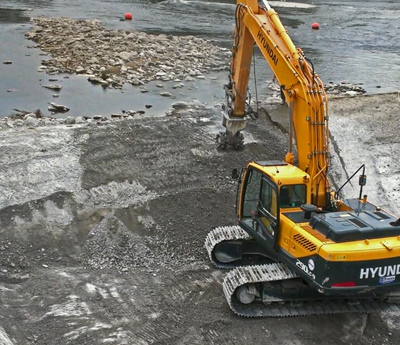 Performance: The customer was very pleased with the performance and expects to speed up the process as the operator becomes increasingly skilled with the Rockwheel. The high torque Rockwheel rotary drum cutter was the ideal solution. Smooth and continuous concrete grinding was rapid and precise. Moreover, after two 34-yd3 sections of the wall were removed the customer remarked: "teeth wear is virtually zero right now, tips look great after 2 monoliths". High quality carbide conical teeth are always in-stock and can be overnighted anywhere in the country but we recommend keeping a few sets on the job at all times. Clean up was easy thanks to a cutting by-product typically 2" or less in size. Compare this to the blocky remains after hammering which are difficult to haul and dispose. The base of the cut was smooth and flat, ready for the next phase of the job. It's cliche but its all about "the right tool for the job". Excavator mounted rock and concrete grinders are one of the fastest growing attachments on the market. No longer a tool for mining and underground construction, these are a versatile attachments that should have a place in every serious contractors toolkit. Add one to your arsenal. www.alpinecutters.com Rockwheel is the original rotary cutter...get only the best. Operationally, the Rockwheel is a simple tool: push the button and the drums spin, rock is engaged and it starts cutting. To help operators get optimal work out of a Rockwheel, we made a short video on how to hit the "sweet spot" while cutting. Check it out! Does your Hoe Ram do this? This is debris direct from a RockWheel G5 cutting on a concrete block. For larger diameter shafts through unstable soils, the use of interlocking hard / soft CFA (continuous flight auger) piles is a highly cost effective method of shaft sinking. 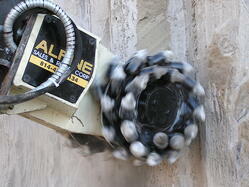 Alpine’s RockWheel rock & concrete grinders are often an important tool in these projects. 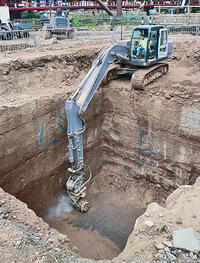 1) Piles are drilled to required depth to form a continuous wall for the shaft. Piles are formed by drilling to the required depth using a hollow stem continuous flight auger. After reaching the designed depth, a concrete is then pumped through the hollow stem. While the concrete is being pumped, the auger is withdrawn at a controlled rate, removing the soil and forming a shaft of concrete. Overlapping concrete columns form the supporting shaft wall. 2) A ring of reinforced concrete is constructed around the top of the shaft to support the shaft wall. 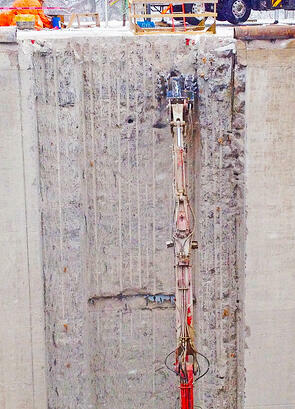 3) Once the outer frame is in place, the main shaft is excavated out with the material lifted to the surface. 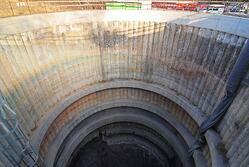 4) Shaft excavation is stopped at specific depths to construct reinforced concrete or steel support rings. For water proofing or installation of support rings, the shaft wall must be ground smooth. 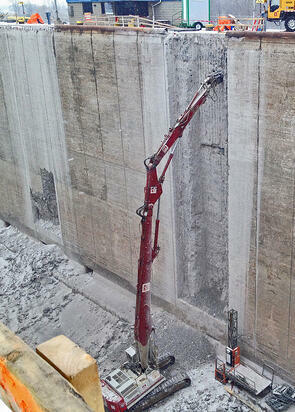 Alpine’s excavator mounted rock and concrete grinders are an ideal tool for rapid and precise concrete grinding. The Alpine grinders can be installed in place of the bucket on the excavator being used to dig out the shaft. 5) Excavation is then completed to the required depth and a steel reinforced concrete slab is constructed at the base of the shaft. Alpine has a wide range of RockWheel sizes allowing the grinding attachment to be utilized on excavators of any size from 1.5-ton minis to 50+ ton heavy excavators. One of the more challenging excavation site conditions is the removal of concrete in wet conditions. The presence of water can drastically reduce the efficiency of an excavation operation by severely limiting the capacity of equipment. To finish these projects in a timely manner, the tools used for the job become very important. The requisite amount of planning and preparation inevitably increases when dealing with wet conditions. In addition to determining what equipment decisions will result in the best work, greater attention to scaling and the slope of grades is needed to ensure that the project will proceed safely at an efficient pace. In situations that call for concrete scaling in wet conditions, an ALPINE drum cutter is usually the best tool for the job. ALPINE drum cutters are precise and powerful instruments that are specifically designed to improve control in scaling. Whether you are operating in wet or dry concrete, drum cutters will provide you with the ability to handle the excavation efficiently. Our cutter heads limit the impact angle between the cutter bits and the surface to create a smooth wall that leaves the underlying concrete undisturbed. This prevents the development of micro-cracks and ensures the material remains sound. Depth gauges are also available to assist in the process of measured scaling. Depth gauges can be used to check top plate angles and cutter length which allows you to limit how deep the cutter head can go into the concrete. If you are looking for improved control, using a depth gauge with your ALPINE drum cutter will provide the improvement you’re looking for. 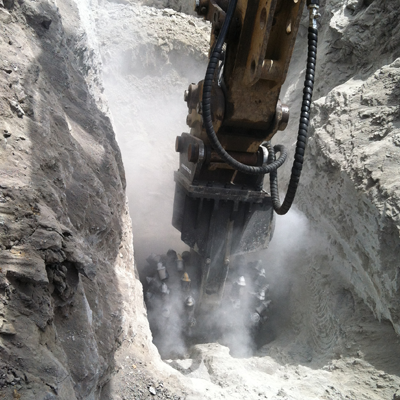 ALPINE drum cutters are well equipped to limit excavation volume. 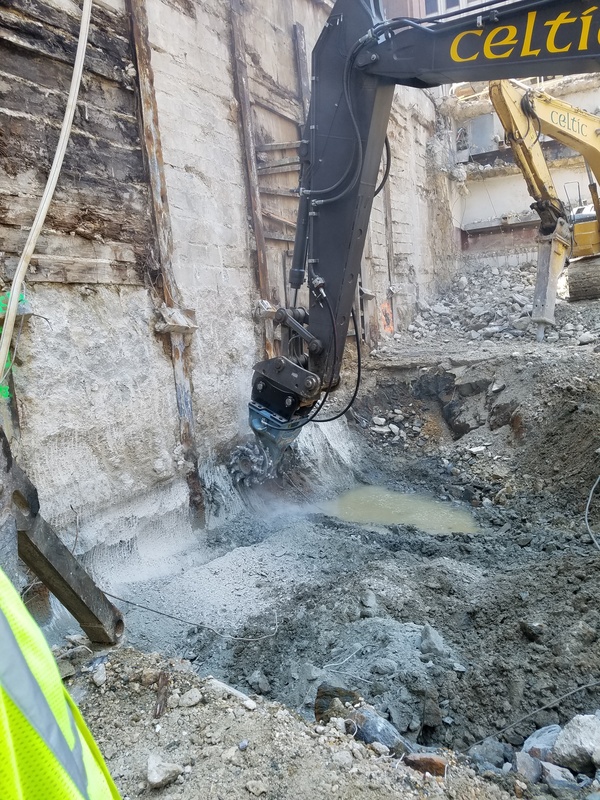 Whether working in wet or dry conditions, our cutter heads have the ability to improve the efficiency of your project by crushing concrete to a fine enough size that it can be used as fill matter on site. No further crushing is necessary which means costly transportation expenses are eliminated as well as additional costs associated with further crushing. Using an ALPINE cutter head will simplify your project by reducing the unnecessary steps that notoriously waste time and expenses. The bottom line results in a more efficient worksite that saves you valuable time and money. 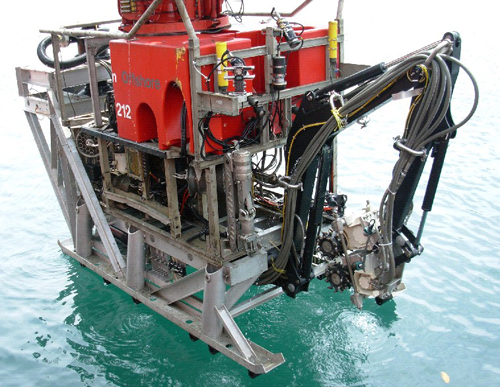 ALPINE cutter heads are also viable options for projects that require underwater scaling. This would be valuable at a site that included a dock or marine facility. It is only a simple matter of using one small oil plug swap to make the cutter head water tight and then the cutter head will work with the same functionality it provides in dry applications. The power and precision afforded by an ALPINE drum cutter makes it the perfect solution for scaling in wet conditions. These carefully designed cutter heads are the logical choice for sensitive removals that require a certain amount of precision. 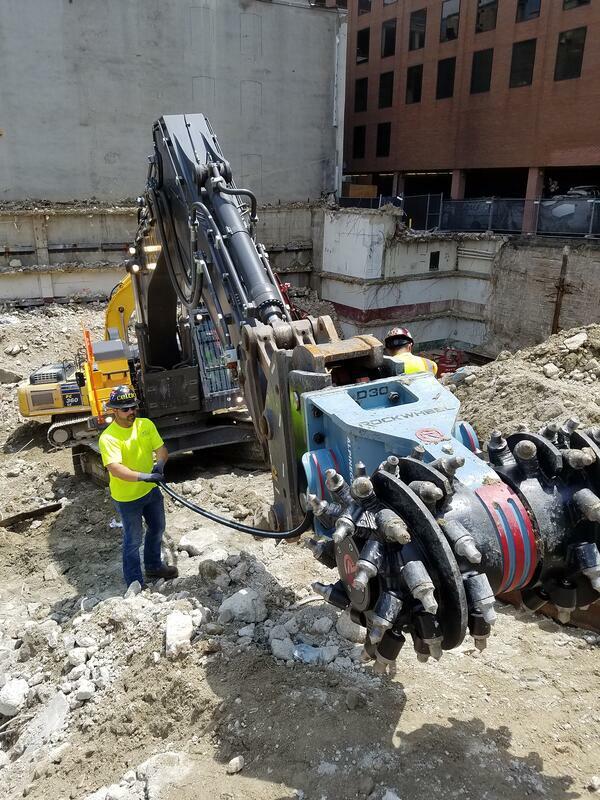 With the superior control the cutter head provides, limiting excavation excess, and the flexibility to work underwater, ALPINE cutter heads are the solution for your next concrete project. How a rock grinder can boost efficiency and reduce cost. Each construction project provides a unique set of circumstances and challenges that calls for creative solutions to meet your goals and deliver on your objectives. The most successful projects are the ones that strike the delicate balance of finding solutions that lower cost without making concessions on quality. For excavation projects that confront you with the toughest rock and concrete structures, rock grinders can be a useful tool to help reduce your cost while increasing efficiency. 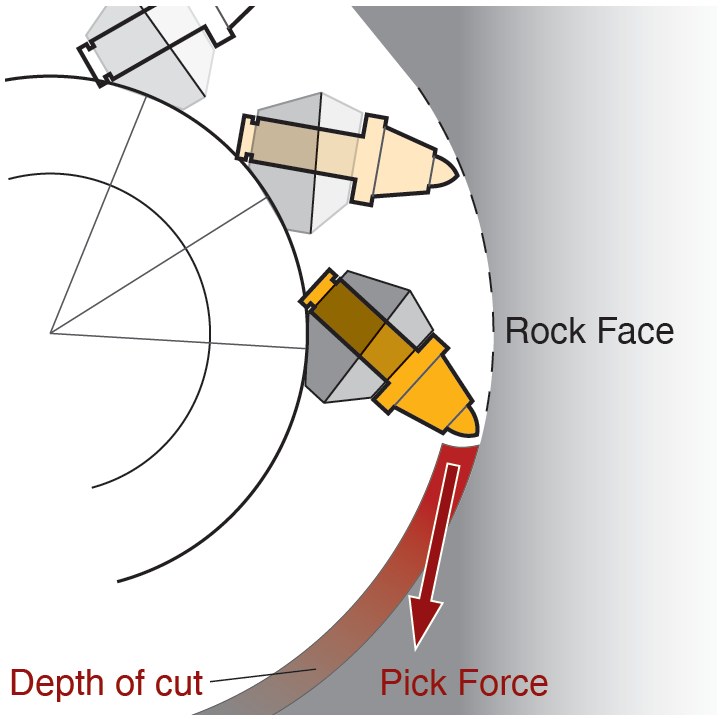 Rock grinders, which can also be referred to as cutter heads, are a precise and efficient way to grind and crush rock. They attach cleanly onto the end of existing excavators and operate by employing the hydraulic lines of the machine to which it is attached. When configured correctly, the cutter head makes quick work of grinding and crushing rock. Rock grinders offer incredible precision. Designed to make powerful even cuts, rock grinders are also capable of cutting with a high degree of accuracy. This gives you greater control over your operation and allows you to cut until your exact specifications are met. Rock grinders are the ultimate precision tool to allow you to work within precise dimensions without collateral destruction. A great example of this is the TC-D cutter head with a cutting force of nearly 18,000 foot pounds. In one case it was employed for a water line trenching job in soft rock of Pittsburgh, Pennsylvania. The cutter head replaced a hoe-ram attachment that was simply poking holes in the rock, and wasn't making good progress. The TC-D exhibited excellent trenching efficiency and cut vertically into the desired width. In addition to effectively cutting rock and concrete, rock grinders are also efficient when it comes to cleaning up the debris. When using a rock grinder, rock rarely needs to be hauled off site to be crushed further. The grinder produces a much more consistent waste product than traditional methods like hydraulic hammers. Rock grinders are also exceptionally precise, meaning that one only grinds as much rock as he or she needs. The condensed waste translates directly into saving you both time and money. The efficiency provided by rock grinders does not come at the price of power. Each individual rock grinder is composed of tough carbide teeth that are fitted on rotary drums. This fitting makes them extremely durable. Rock grinders are exceptionally resistant to wearing out. Unlike some other applications, rock grinders can be counted on for more than one project before needing to be replaced. Being able to use a rock grinder for multiple projects that involve a variety of surfaces makes rock grinders a valuable investment. Alpine rock grinders provide an unparalleled combination of efficiency and durability. If you are searching for a versatile tool that can increase the efficiency of rock or concrete removal in sensitive areas, then an Alpine rock grinder could be just what you need. Alpine offers a full line of rock grinders that are sure to be suited to your unique situation. Grinders can be selected on the basis of size and horsepower to ensure that you receive the best option available. Our dedicated team of experts is readily available to provide you with assistance every step of the way. Lower the cost and increase the efficiency of your next project by calling today. We get this question a lot: "how far can these things go into the ground" or "will the Rockwheel work on a long reach excavator?" Answer: Yes! There is no depth restriction, heck we've even had cutterheads working several thousand feet underwater. 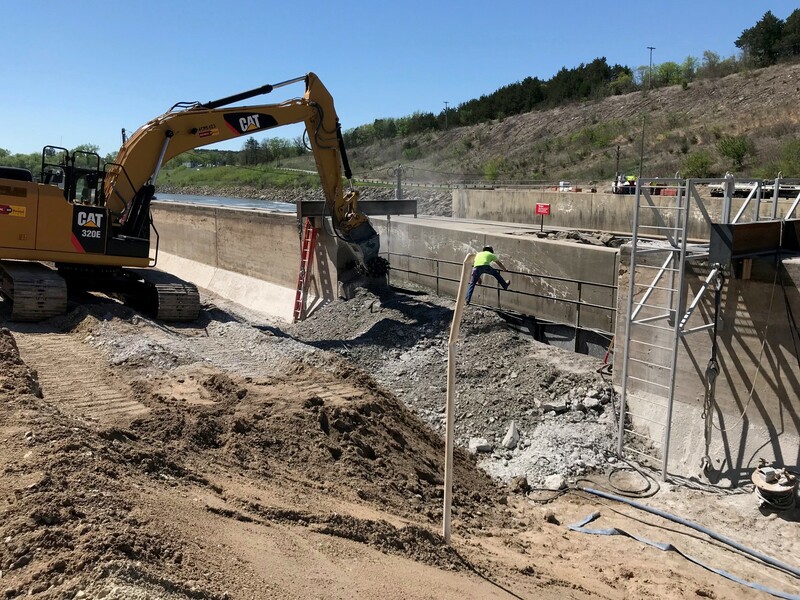 And this photo below shows a very long reach excavator running an Alpine Cutterhead on a recent job concrete scaling in a canal rehab project. The concrete was drilled at the maximum depth of the removal, as a stopping indicator. Next, the majority of the concrete was removed with a hydraulic hammer. Finally, the cutterhead scaled the remainder down to tolerance. This gave the wall face a solid, clean finish that could easily resurfaced. Due to the nature of mixing concrete and its status as a composite material, no two concrete structures will be exactly identical and a variety of factors will impact how the concrete stands up over time. 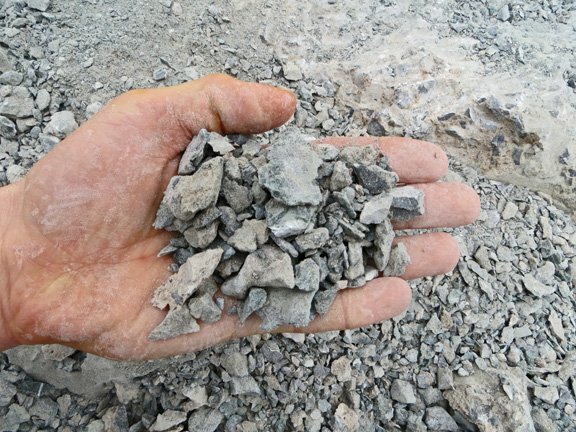 Concrete is made by mixing cement, and aggregate materials such as sand and gravel. The cement acts as a binding agent that fills in the pores and empty space of the aggregate materials to form a relatively lightweight composite material. This process makes concrete comparable to conglomerate rock when it comes to determining the best way to handle construction projects that involve the removal of concrete. Generally over time, concrete will degrade due to exposure to weather and other factors that may include poor quality of concrete or improper finishing and curing. As the concrete loses its structural integrity it becomes weak and brittle. This can make concrete especially susceptible to over-breaking. There are several steps companies can take to limit over-breaking during the course of their project. The first step to limiting the negative effects of over-breaking starts with the company’s employees. There is no single resource more valuable to a company than their employees. A well-trained and reliable workforce can combat over-breaking simply by applying proper technique. Good operator technique results in a smooth and consistent force applied from the RockWheel to the concrete. Little to no ‘bounce’ applied to the concrete will produce the best results. 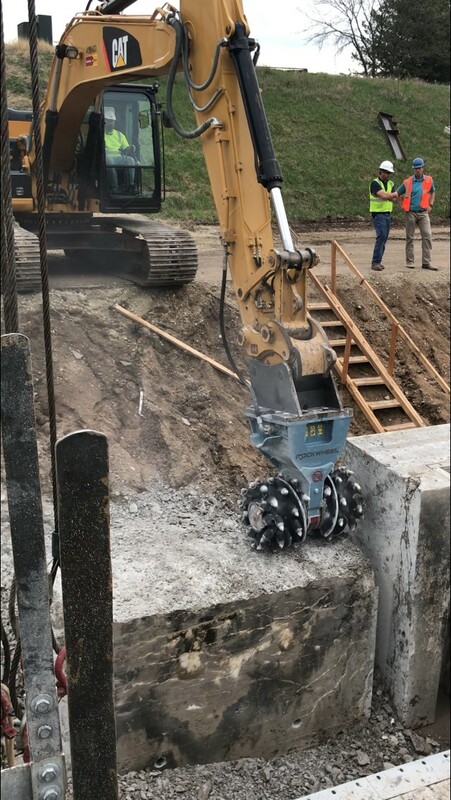 If the operator is a first time RockWheel user, let them get a feel for the capability and control before digging into the concrete structure. Another small tip that can make a big difference is simply to make sure the set up on the excavator is optimal. We can check your settings and confirm that your equipment is primed to perform at the highest possible level for the conditions in which they will be operating. Additional work in preparation can make a big difference during operation. After these first two preliminary steps, there are also a couple of tips that will prevent over-breaking during your actual operation. During the process of scaling concrete structures an important area to keep your eye on is pick life. For the best results and minimal over-breaking, picks should only be used while in good working condition. It is easy for picks to face wear and abrasion which significantly diminishes their useful capacity. If the pick wears too much it can begin to crack which will decrease its efficiency and create over-breaking. It may be tempting to try and save money by using picks as long as possible, but using a pick past its lifespan will produce inferior results. As you progress through your project you will be able to tell how your picks hold up to the concrete and how many picks will be necessary to finish the project successfully. Rebar is very hard compared to concrete and can cause pick cracking and increased wear. Always be sure, if rebar is present, that the picks have not broken out carbide tips or wear that is preventing optimal grinding. By devoting extra attention to technique, operating life, and the composite material, you will be able to greatly limit the negative impact of over-breaking and enjoy success in scaling concrete structures. Does your hammer do this?